Sarah Connor has spent the last fifteen years of her life protecting her son, John Connor, from machines of the future called Terminators. Before he was even conceived, she was told that her son would rise up and become the leader of a group of human freedom fighters, known as the resistance, in a world controlled by a powerful computer called Skynet. The Sarah Connor Chronicles takes off in Red Valley, New Mexico, in the year 1999, where John Connor has just started a new school. During John's first day of school, a female student named Cameron introduces herself to him in class. By the second day, after she has run over the mechanical substitute teacher with a pickup truck, we realize Cameron is a terminator sent from the future once again by John, to help protect his mom and his younger self. Running for their lives leads John, Sarah, and Cameron to a bank vault in Los Angeles where there is a standoff that leaves the enemy terminator destroyed and the three fugitives eight years into the future. Their mission now is to find the person who will build Skynet and stop it by any means possible. As the stories get more complex throughout the series, so do the characters, including the FBI agent Ellison, whose religion plays a huge role in how he deals with his on-going investigation of Sarah and John. Cameron seems to have some issues of her own when she begins hiding scrap parts from other terminators that have fallen due to battles with the trio. All in all, the story is mainly about Sarah, a mother who is forced into protecting the savior of the future world from an enemy that should not even exist yet. The Connor's and Weaver face an epic battle that will change everyone's fortunes. John is one step closer to catching Weaver while on his mission to rescue Skynet's latest target. Sarah and Ellison's reunion causes a change in their plan. Weaver discovers Ellison's secret. Sarah hides John with Charley Dixon, the only person she thinks she can trust. Meanwhile, Derek struggles to work together with Cameron, and someone compromises John Henry, putting Catherine Weaver's efforts at risk. Jesse takes on the most important mission of her life. Sarah and John face a tough decision to leave their house. Sarah is forced to seek help from nightmares at a clinic. She tries to figure out Skynet's next move. Sarah, John, Cameron and Derek go in search of clues connected to a factory that has been torn down. Weaver sends a man to the same place to look for survivors. Sarah and Cameron must save a family connected to Derek. Meanwhile, Jesse's life is threatened. History is forever changed as a Terminator is sent back into the wrong time. Meanwhile, Cameron's secret life is revealed to all. Sarah faces deja vu when her nightmares conflict into real life meaning trouble for Sarah and John. Derek and Jesse look into a Skynet schemer. John and Riley face some fatal aftermath on their trip to Mexico. Sarah and Ellison finally meet up. A software glitch causes Cameron to forget who she is. She goes missing from the Connors and is taken in by a street kid named Jody. Cameron and Jody end up at a halfway house where Cameron meets with a social worker who uncovers some of Cameron's distant memories. Meanwhile, Catherine Weaver meets with Agent Ellison to discuss his future at Zeira Corp, and Ellison does some digging into Weaver's past. Sarah finds herself in a business transaction with a mysterious business man, who threatens to tell their whereabouts to the FBI. Meanwhile, Cromartie closes in on John and Agent Ellison discovers a nemesis at the agency. John defends Cameron against a damning accusation by Derek, putting him and Derek at odds, while Sarah finds herself in a business transaction with a mysterious business man. Meanwhile, Cromartie closes in on John and Agent Ellison discovers a nemesis at the agency. While breaking in to Agent Ellison's apartment, Sarah discovers a file on her from her time spent at the mental hospital. This leads Sarah to locate a doomsday convert, named Dr. Silverman. John finds out how Sarah escaped the mental hospital, and Cameron joins a ballet class. While in and out of consciousness and fighting for his life, a Stranger flashes back to the year 2027, remembering his life in the future and his personal battle against the machines; meanwhile, Sarah finds herself trying to explain the past to Charley. When Sarah's friend Andy submits his computer into a chess competition, she revaluates his computer's capabilities and worries where it could all lead. During the chess match, Sarah comes face-to-face with a stranger whose history is closely tied to hers. Meanwhile at school, Cameron gets called into grief counseling and John makes a new friend in shop class. Agent Ellison discovers remnants from a terminator battle. Sarah pays a visit to Miles Dyson's widow looking for Skynet's creators. Her search leads her to Andy Goode, a cell phone salesman who also happens to also be the inventor of a chess playing computer known as "The Turk." Sarah has to make a tough decision regarding her friendship with Goode. Meanwhile, John and Cameron try their best to assimilate on their first day at the new high school and John is conflicted about his role as a hero. Agent James Ellison finds himself getting closer to the truth. After living a life of peace John and Sarah once again keep running, leaving behind their life and the people that loved them. 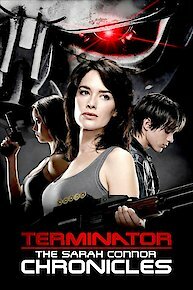 A new terminator is sent back to protect John and one is sent back to terminate him. In order to prevent his death and judgment day, John, Cameron, and Sarah hide in the one place nobody will ever think to find them. Terminator: The Sarah Connor Chronicles is currently available to watch free on Crackle and stream on FOX. You can also stream, download, buy, rent Terminator: The Sarah Connor Chronicles on demand at Amazon, Google Play, iTunes online.